Airfares keep changing from time to time. This is because airfares are fixed on the basis of demand and supply. Many a time, you and a person sitting next to you on the same flight, pay different fares to travel to the same destination. So, you must be very careful while booking flight tickets. 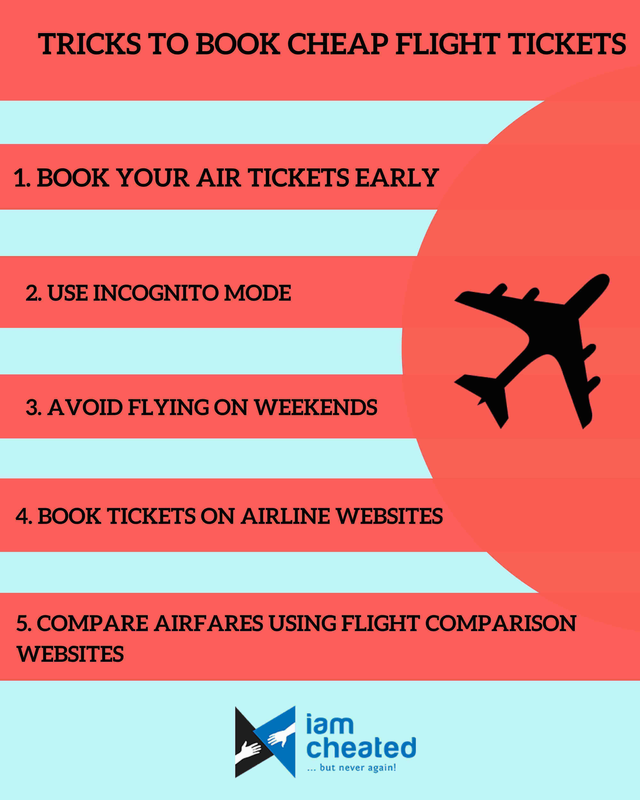 In this blog, we will discuss some tricks which can help you book cheap flight tickets. The best way to get a discounted air ticket is planning your travel, well in advance and booking your ticket early. The correct time to book air tickets is somewhere between 45-90 days, before the date of departure. But, make sure you do not book too early. Flight booking websites record your cookies and server details, every time you visit their portals. So, the moment you visit the same website for the second time, the website server reads your details and shows raised airfares. This can be avoided by using the private browsing mode or popular Incognito mode in Chrome browsers. If you are using the browser in normal mode, you should clear all cookies or use a different browser or computer to open the website. Flying on weekends is never a good idea. Price of flight tickets is fixed on the basis of demand and supply. So, when demand is more, airfares will go up automatically. Airfares usually go up on Fridays and start coming down on Mondays or Tuesdays. So, the best time to book ticket is on Wednesdays and Thursdays. There are plenty of travel booking websites, where you can book your flight tickets easily. But, these websites are very smart, so you should be very careful while booking your tickets. These websites will show good offers when they show you search results, but when you book, you will end up paying more than what was shown. This is because your final bill includes service charges. Make sure you use flight comparison websites such as Kayak or Google Flights, before you book your flight tickets. These websites provide you detailed information on flights to your destination and prices offered by airlines.